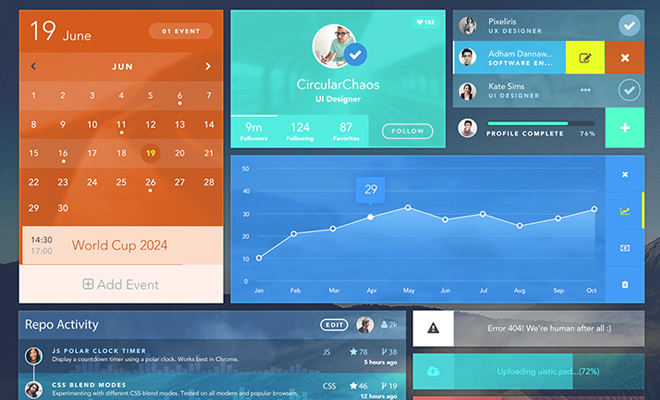 Interface design is the cornerstone to any type of digital design career. Whether an interface is created for the desktop, web, or mobile, plenty of features tend to overlap and lead to the same conclusion. Learning how to craft a reliable interface is more about the overall user experience rather than specific graphic design techniques. 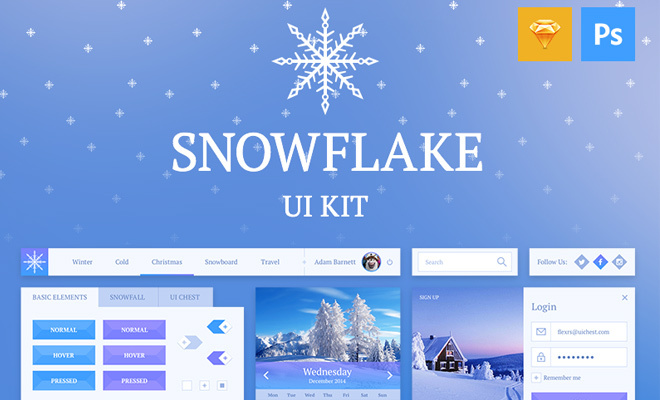 For this post I’d like to explain some underlying concepts that can be used to construct an enticing user interface kit. 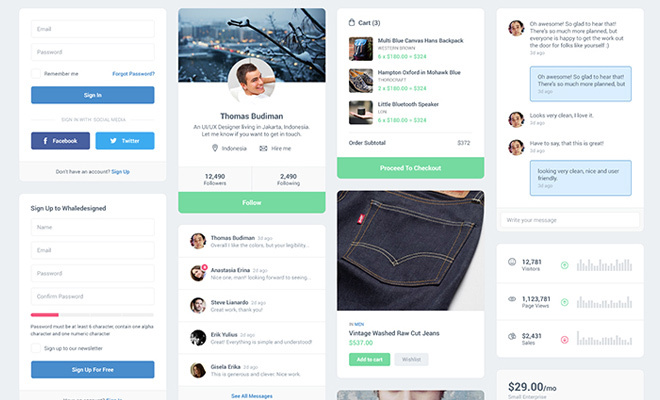 Some designers like to release these as freebies while others create them solely for project work. 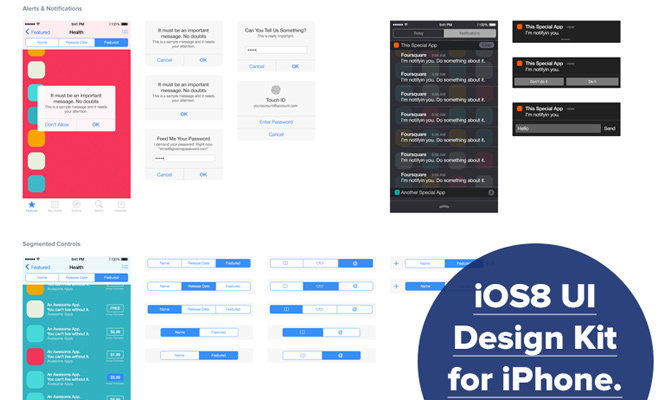 Either way the process turns out exactly the same and once you learn how it all works you’ll fall in love with UI kit design. And like the great Ella Fitzgerald often asked: why shouldn’t we fall in love? 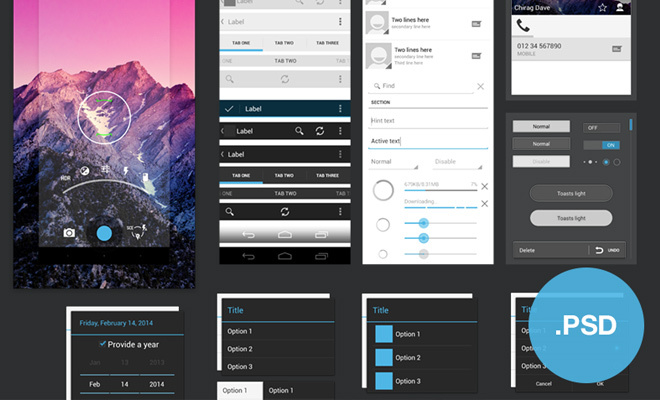 First up is the notorious form field design. Why so much notoriety? Because most websites and mobile apps require some type of complex input fields. This can be one of the trickiest elements to create because you want every field to match internally while also matching the website’s outer design. 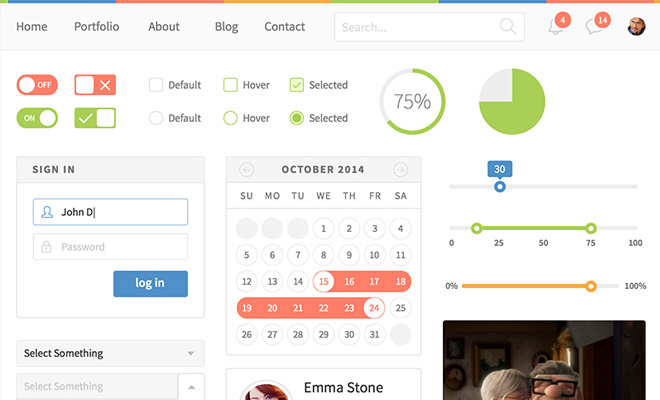 To get started make a list of all the important form input fields. Obviously you should create a few text inputs and textfields like you’d find in a contact form. It may also be a good idea to design a customized submit button. But where do you go from there? Well perhaps you could design more abstract fields like checkboxes, radio buttons, and upload inputs. You might even go into detail by creating text fields meant for specific content(passwords, telephone numbers, email addresses, etc). You might also wish to include some error & success popup messages. Sometimes these messages can bleed into typical form labels which are also very important. Since websites and mobile apps both require input fields, designers should really be sure to include these features into every UI kit. 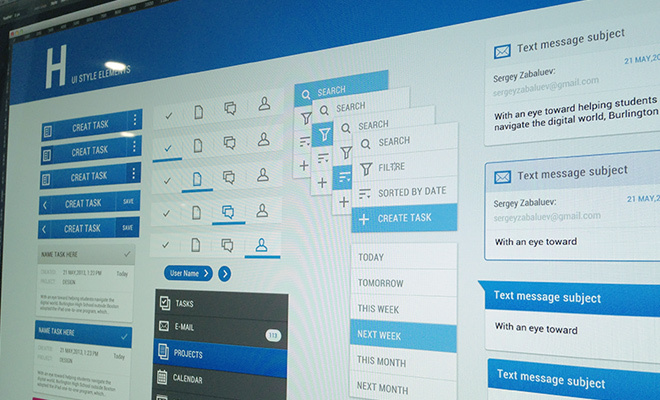 What interface could be complete without a navigation? I suppose single-page layouts could work fine but that defeats my point so we’ll put that aside. 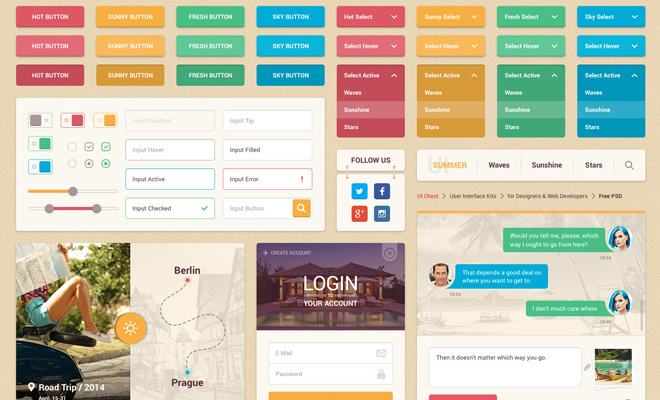 Most user interfaces require a navigation and some require different styles of navigation. Aside from the obvious navigation bar what else could be useful? Well it would be cool to see dropdown menu styles and how many tiers should be included(sub-menus or sub-sub-menus). Also think about on-page links such as breadcrumbs or tabbed widgets. 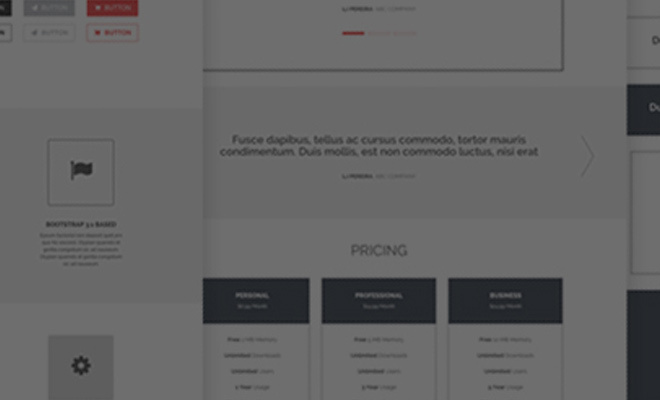 All of these links behave like navigation and could be vitally significant to a UI kit. 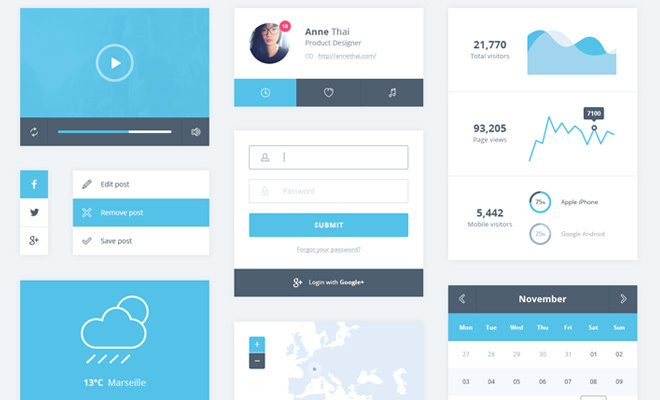 Just be sure that each navigation design is created in a way that’s practical. Designing is fun and it’s easy to get carried away with big glossy effects. But developers need to actually recreate this stuff so it’s important to leave them with something that can be coded into HTML/CSS. 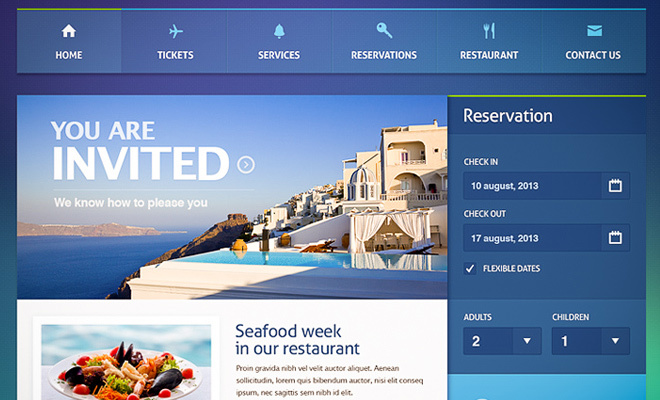 Depending on the type of interface kit you may not even require a lot of navigation elements. 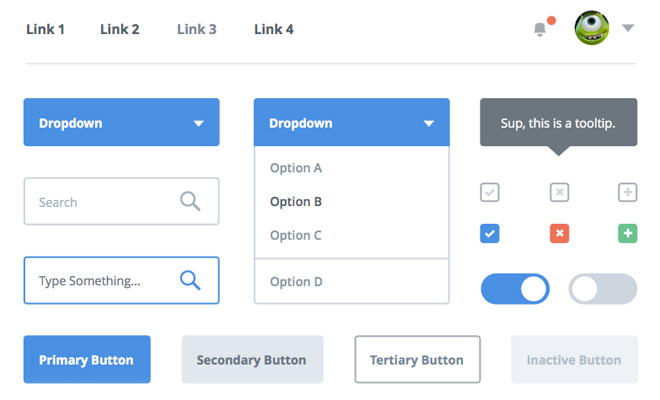 But every interface needs some method of navigation whether it’s horizontal or vertical, flyout or fixed, dropdown or sliding. Websites are designed differently but they’re meant to function in a similar fashion: easy and usable navigation. Some designers may disagree on this topic but it is rising in popularity thanks to HTML5 and CSS3 code libraries. Media players are considered extremely useful in most circumstances because not everyone wants to host on external services like YouTube or SoundCloud. Naturally the first thought you’ll pick up is an audio or video player. These are the most popular forms of digital media and both require players to be embedded into the site(or linked externally) for visitors to consume. But what about other types of media like photos? 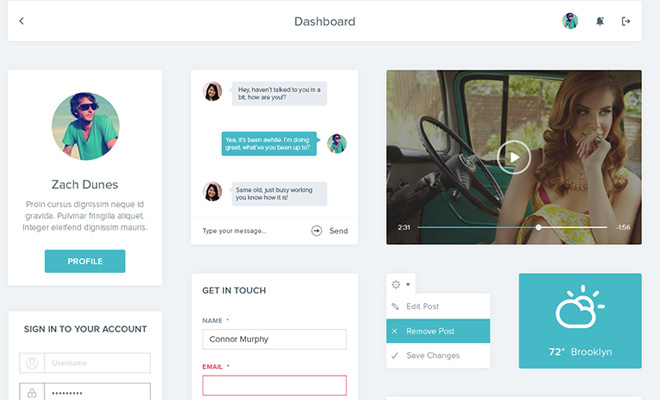 Could your UI kit benefit from a simple photo slideshow or carousel? Getting down and dirty with custom media players can be tough. Developers crave structure and giving them a picture-perfect concept makes the development phase 10x easier. 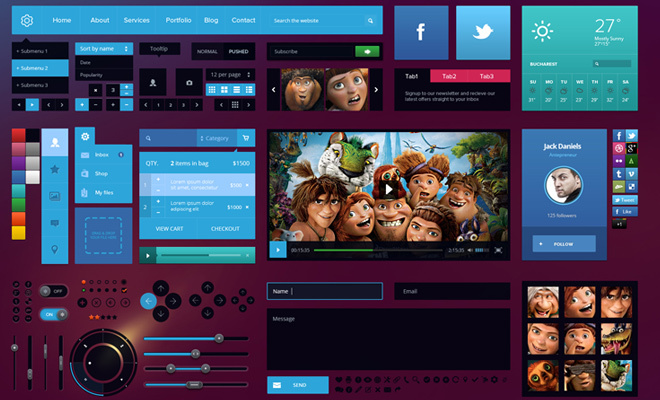 Be sure that your media interfaces are realistic and usable. Imagine you were to use your own interface – would it be easy? Does it make sense from a visceral standpoint? The best media players are just instinctually easy to pick up and use without much thought. If you have all the basics and want to add some more features then tack these onto your list! 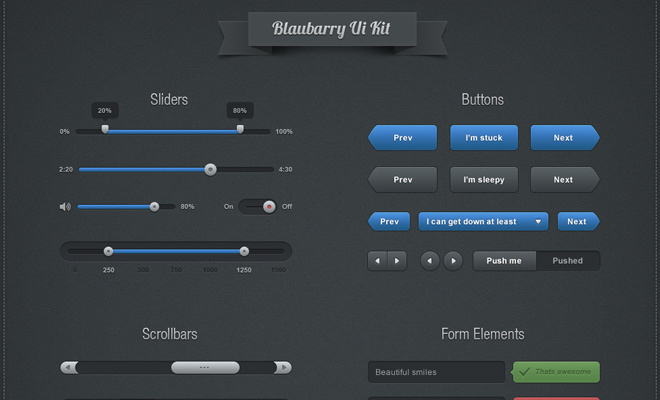 Extra widgets are perfect for kicking your UI kit into first place blue-ribbon quality. Try designing other items that may prove useful to single pages in the design. For example a calendar or date picker interface may be useful in some forms. Also consider something like a weather widget or interactive map display. If numerical data is a big part of the project you might include graph and chart designs for data visualization. 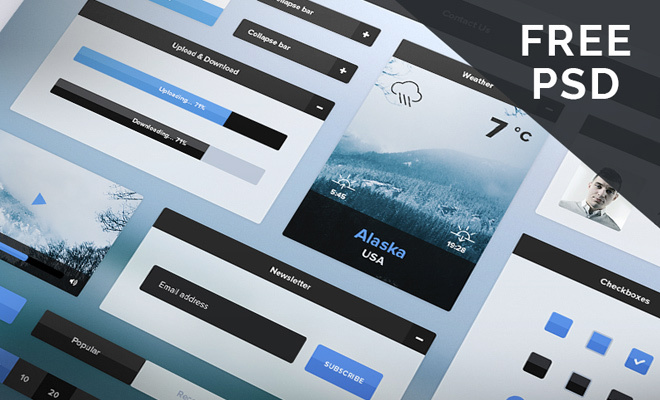 When moving into widget design consider starting with a basic mockup or wireframe. Look at what other designers have created and feel out their concepts. This requires a bit of lateral thinking on long-term projects. 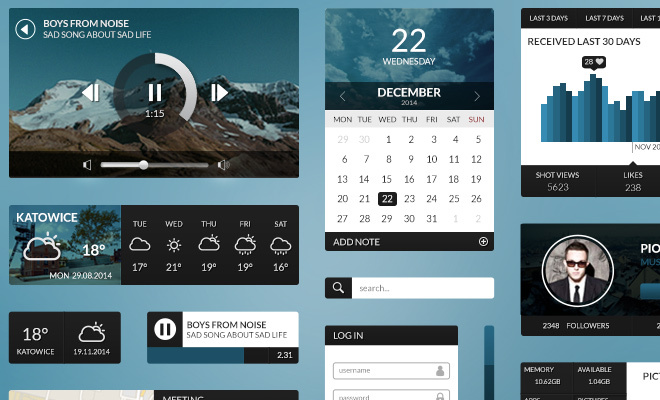 How can you build an interface that’s usable and true to the original design? 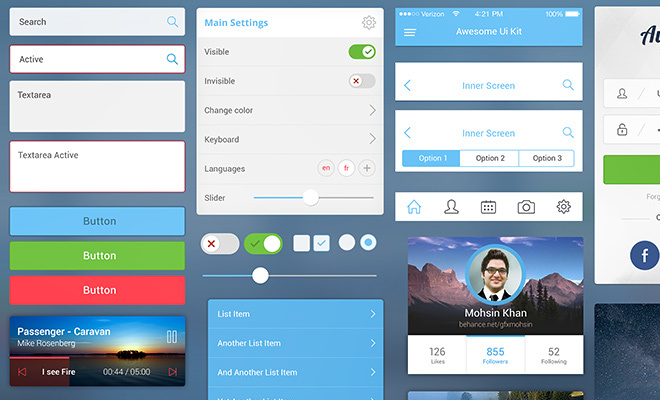 UI kits are meant to be one unified design concept. It takes practice and lots of failure before you’ll design something that truly brings you pride. Just keep at it and don’t get discouraged! Everything is hard at first. But like my buddy Jake the Dog once said: sucking at something is the first step to becoming sorta good at something. 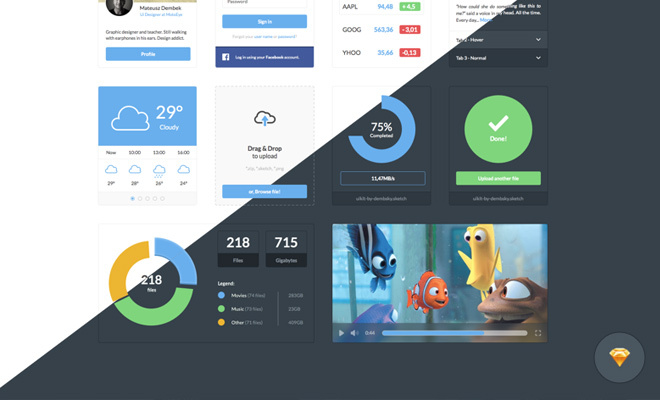 Along with the many examples from this post I’ve also put together a set of 15 brand new UI kits released in the past year. Most are dedicated to web design but some others relate to mobile app UI and even desktop software GUI design. Every single one of these kits is free to download and use on any project commercial or otherwise. Be sure to check out the description to see if the filetype is meant for Illustrator, Photoshop, or Sketch. All resources are built using vector shapes so they can be rescaled and fitted into any design project.